The gap has widened in the latest national poll. Hillary Clinton's double-digit lead over Donald Trump in the latest national poll is significant, and her standing among minority voters is even more dramatic. An ABC News/Washington Post poll released Sunday has Clinton leading among nonwhite voters by the biggest margin yet: 77 percent of nonwhite voters side with the presumptive Democratic nominee, compared with 15 percent who prefer her Republican counterpart. "It is an election that is totally driven by the divisions in the country," ABC News political analyst Matthew Dowd said today on "Good Morning America." "It is white voters overwhelmingly for Donald Trump, nonwhite voters overwhelmingly for Hillary Clinton. Older voters for Donald Trump, younger voters for Hillary Clinton. The educated voters for Hillary Clinton, high school voters for Donald Trump," he said. While Trump has maintained a lead among white voters, the gap there is shrinking. In a March ABC News/Washington Post poll, Trump had a 9-point lead among white voters; that margin went up to 24 points in May but is now down to 10 points. 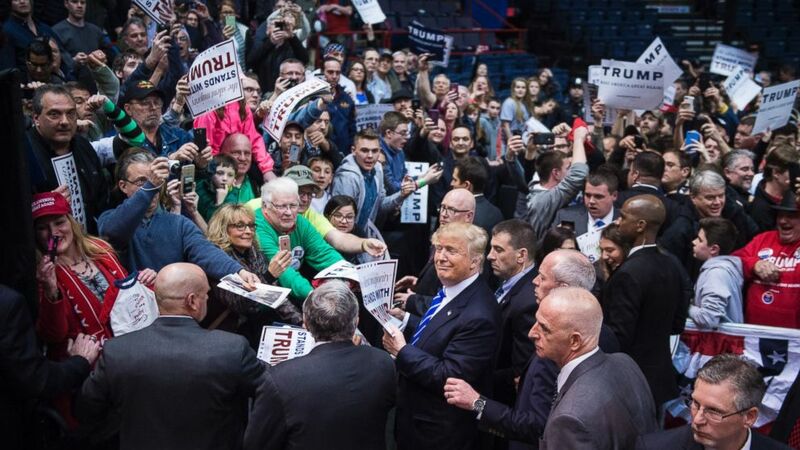 (Jabin Botsford/The Washington Post/Getty Images) Supporters reach for handshakes, photos, and signatures as Donald Trump greets the crowd after speaking during a campaign event at the Times Union Center in Albany, New York, April 11, 2016. Meanwhile, his deficit among nonwhite voters has been larger throughout. Clinton has consistently held a lead in that group. In the March poll, she received 73 percent of the vote preference among nonwhite voters, compared with Trump's 19 percent. That gap decreased slightly in late May, when the overall poll was effectively a dead heat, with Trump at 46 percent and Clinton at 44 percent. In that poll, she led among nonwhite voters, 69 percent to his 21 percent. This latest ABC News/Washington Post poll shows that she has gone back up among nonwhite voters, opening the biggest gap yet. Clinton's lead is clearest among black voters, with her holding 90 percent to Trump's 8 percent among that demographic, and it's also significant among Hispanic voters. 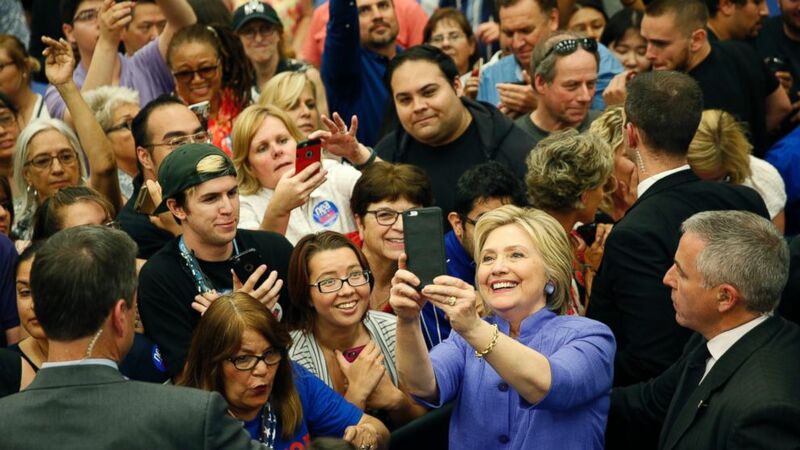 (John Locher/AP Photo) Hillary Clinton takes a selfie with supporters at a rally at California State University, San Bernardino, in San Bernardino, California, June 3, 2016. The poll, which has Clinton leading 69 percent to Trump's 20 percent among Hispanics, came in the wake of Trump's allegations that a judge from Indiana could not be impartial in cases involving the now-defunct Trump University because of his family's Mexican heritage. That controversy, coupled with Trump's regular calls to build a wall along the U.S. border with Mexico, has Latino voters uneasy. J. Santos Trejo is one such voter in Texas. He is a 42-year-old landscaper in Houston who became a U.S. citizen in recent years after arriving from Mexico more than two decades ago. Trump "is talking too much about Latinos," he told ABC News. Trejo said he doesn't know whether Trump "really means" what he's saying "or if he's just talking like that to be famous. I don't know what he's thinking in his heart."